To reduce the costs further I wanted to replace the piggy back print housing the gyro and accelometer sensors on both the Elektor and Zzaag designs. This is available from fun components and is called the SEN01 sensorboard. They cost 75.50€ and have a 2 axis gyro and three axis accelerometer of which 2 axis are actually wired to the processor board. 1) The Wii Motion plus has a three axis gyroscope and the Nunchuk has a three axis accelerometer. These components can be bought separately and cost around 20€ each. Later on i will explain how these can be used and connected. 2) Another solution is to use one of the two ready made boards below. 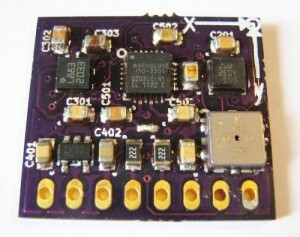 The board below on the left from www.DroTek.fr costs 41.90€ so is on the same price level as the Wii solution but additionally has a HMC5883 magnetometer which allows stabilisation of the yaw rotation which can not be achieved with only gyro and accelerometer. 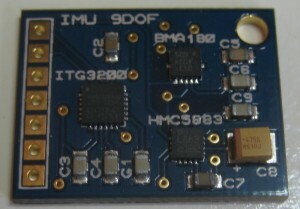 3) Another very nice IMU is the one that can be found on FreeIMU. This has been developed by Fabio Varesano and is now at version 0.3.5. I recommend the version that has the BMP085 pressure sensor in addition to the BMA180 accelerometer, ITG3200 gyro and the HMC5883L magnetometer (the HMC5883L version is an improved one over the HMC5883). 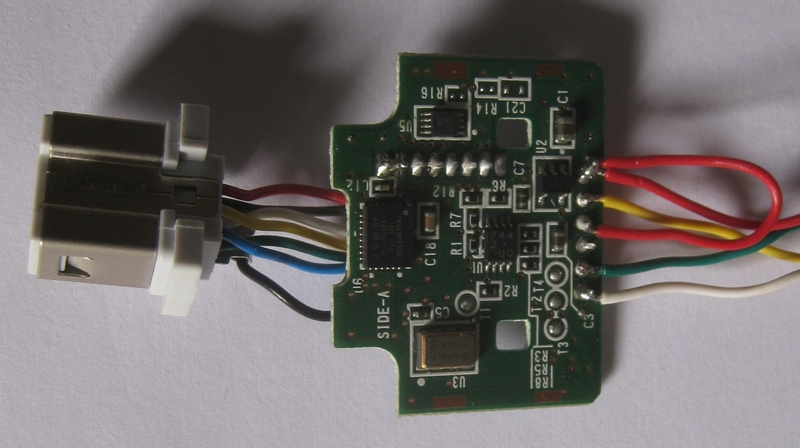 The pressure sensor is used in helicoptor flight control but is not required for the Seguino. Eagle files BOM and gerbers can be found on Fabio’s site. 4) Make your own print using the different components which you can buy below. www.DroTek.fr HMC5883L 5,90€ , ITG3200 15,90€ and the BMA180 12,90€. Finally the BMP085 costs 7,90€. www.viacopter.eu HMC5883L 6.00€ , ITG3200 15.00€ and the BMA180 10.00€. Finally the BMP085 costs 10.00€. www.lipoly.de HMC5883L 3.90€, ITG3200 14.90€ and the BMA180 12.82€. Finally the BMP085 costs 6,79€. 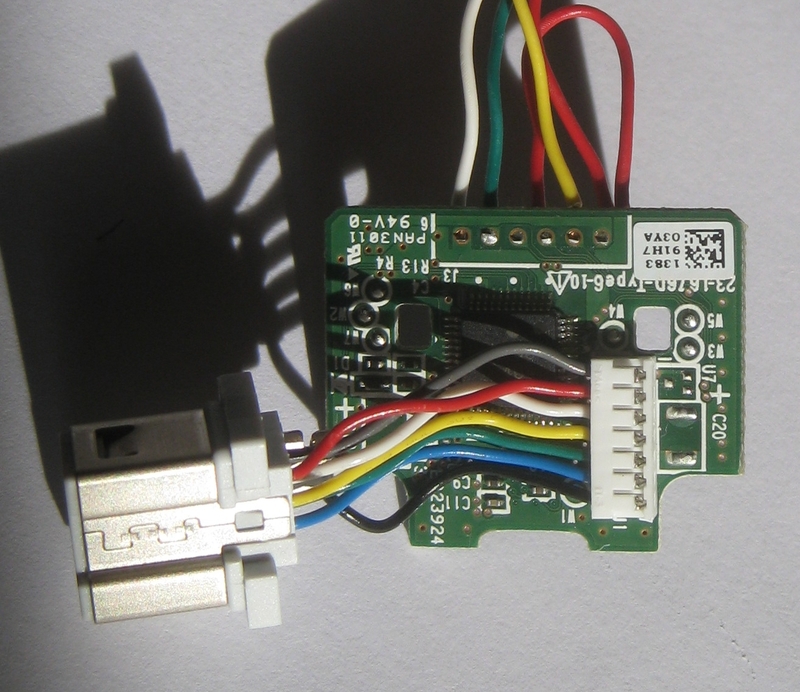 This last site will also sell the MPU-6000 and MPU-6050 at a price of 24.90€ when they become available. The MPU-6000™ family provides the world’s first integrated 6-axis motion processor solution that eliminates the package-level gyro/accel cross-axis misalignment associated with discrete solutions. The devices combine a 3-axis gyroscope and a 3-axis accelerometer on the same silicon die together with an onboard Digital Motion Processor™ (DMP™) capable of processing complex 9-axis sensor fusion algorithms. The parts’ integrated 9-axis sensor fusion algorithms access external magnetometers or other sensors through an auxiliary master I2C bus, allowing the devices to gather a full set of sensor data without intervention from the system processor. The devices are offered in the same 4x4x0.9 mm QFN footprint and pinout as the current MPU-3000™ family of integrated 3-axis gyroscopes, providing a simple upgrade path and making it easy to fit on space constrained boards. If you look at the price of the sensors that go into the DroTek board you are already at 30.00€ so that passive components plus board only cost 10.00€ which is a good price and avoids the hassle of making your own board. If you want the BMP085 pressure sensor you can use the viacopter print but remember that this is not really needed for the seguino. So by selecting the any of these solutions you save 35€ and in addition have 3 axis on both the accelerometer and the gyro. I finally chose the Wii route so below you can find a description of how to connect and use the Wiimotion plus and Nunchuck. The Wii Motion Plus contains two gyro sensors: A dual-axis gyro by InvenSense, the IDG-600 (pitch and roll), and a single-axis gyro by EPSON TOYOCOM labelled X3500W (yaw). The combined use of a dual-axis gyro and a single-axis gyro is what enables the Wii Motion Plus to report the angular rate in all three axis, thus allowing full orientation tracking. Specifications of the X3500W are currently unknown, but may be similar to the specifications of the similarly named XV-3500CB (same manufacturer.) 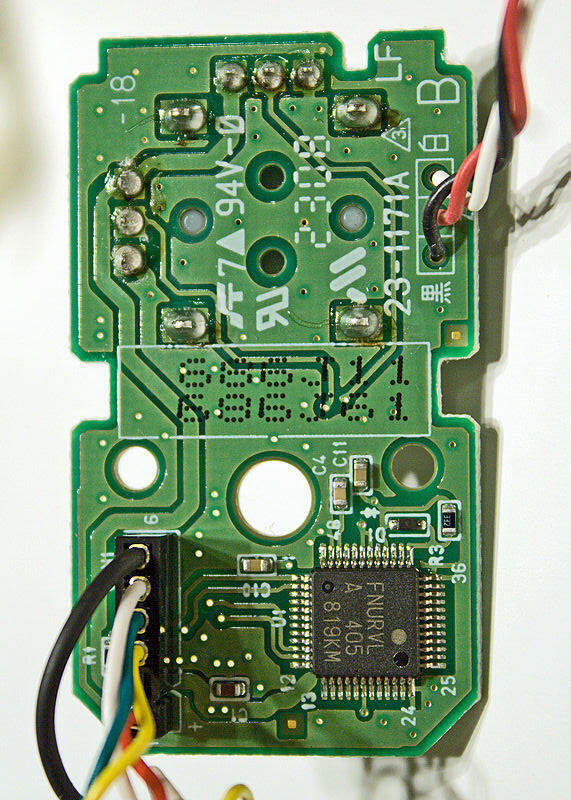 The Wii Motion Plus contains RVL-GU chip and EEPROM. RVL-GU chip is a NEC 78K0/KC2 microprocessor. The best place to learn about the Nunchuk and Wii Motion Plus is on the following link http://wiibrew.org/wiki/Wiimote/Extension_Controllers. Here you will find all sorts of information regarding these two items. It is possible to read from both Wii Motion Plus and the Nunchuk at the same time by activating the Wii MotionPlus in one of the pass-through modes suggested by DogP. 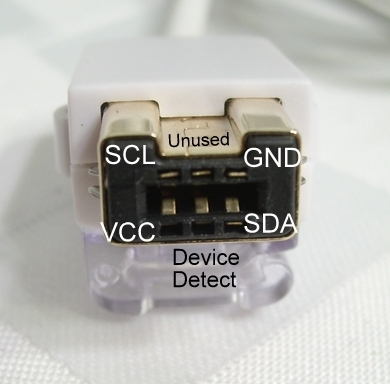 When activated, this interleaves Nunchuk data with Wii MotionPlus data on every other read. Data passing through are modified to make room for 3 bookkeeping bits. Below you can see the differences between normal mode and passthrough mode. 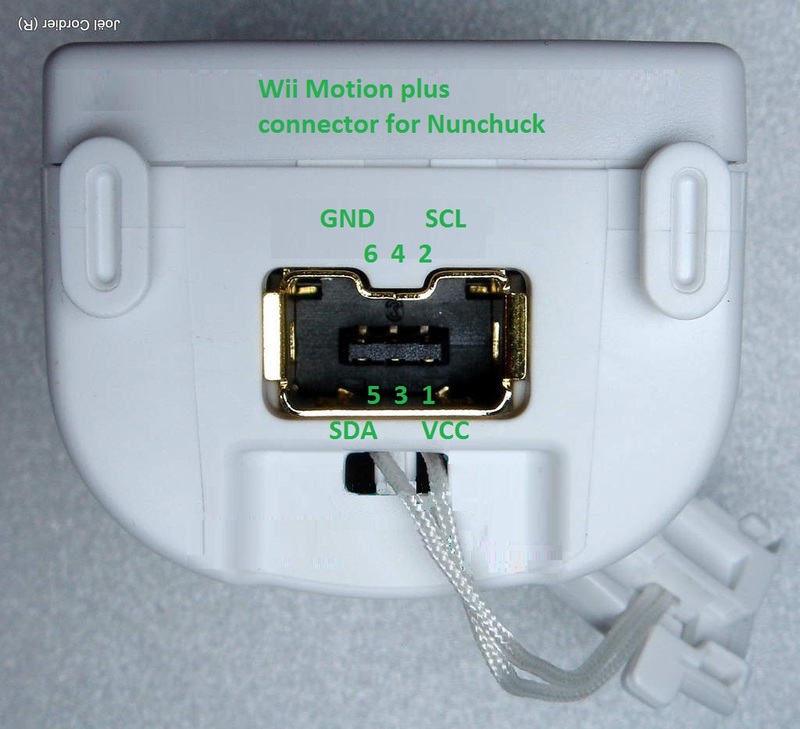 Below is a detailed photo of the Nunchuk and of the Wii Motion Plus showing also the connectors. This is the Wiimotionplus connector view is looking at the connector towards the wires. The Wii Motion Plus starts off at register 0xA60000 = 0x53 instead of register 0xA40000 = 0x52 (A6 = 1010 011x where x=read or write 0/1 right shift this and you get 0101 0011 = 0x53) which the Nunchuk uses, because it has its own extension port on the back allowing a Nunchuk for example to be plugged in along with the Wii Motion Plus. BUT it changes to 0xA40000 once it is activated by writing 05 to 0xA600FE. The extension is initialised by writing 0x55 to 0xA600F0. While the Wii Motion Plus is still, the values will be about 0x1F7F (8,063), although it is best to calibrate for a few seconds every time you start, to get the actual zero values. 20 represents turning at about 1 degree per second. So divide by 20 to get the degrees per second. At high speed (Low speed bit = 0) 20 represents turning at about 5 degree per second. So divide by 4 to get the degrees per second. The gyros are slightly noisy, so you should assume any speed less than 0.5 degrees per second is actually zero. Yaw/Roll/Pitch fast/slow bits are 1 when the Wii Motion Plus is rotating slowly (or not rotating at all), 0 when the Wii Motion Plus is rotating fast. 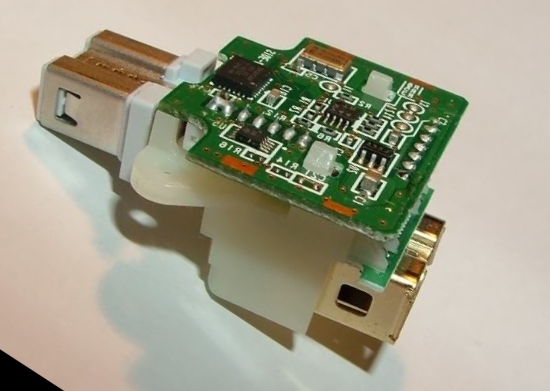 Extension connected is 1 when an extension is connected to the Wii Motion Plus extension port. Note: The definition of yaw, pitch, and roll, are slightly different for the gyros and accelerometers. Accelerometers measure angles relative to gravity. Gyros measure angles relative to the Wii Motion Plus. If the Wii Motion Plus is up the right way, then they are the same. But if the Wii Remote is on its side, then what the gyros call “pitch” is actually what the accelerometers would call “yaw”. This is why the relative orientation between the Wii Motion Plus and the Nunchuk is important. If you do not want to change then make your assembly the same as mine. The connections are shown on the drawings and hopefully do not need a further explantion. I have seen power connecting colours on the Wii Motion Plus which are brown or grey. In all cases this was pin7. Now for the software. So far the Wii Motion Plus and Nunchuk can talk to the board and a Kalman filter allows stable reading on the Roll and Pitch angles. // Modified Kalman code using Roll, Pitch, and Yaw from a Wii MotionPlus and X, Y, and Z accelerometers from a Nunchuck. // Also uses "new" style Init to provide unencrypted data from the Nunchuck to avoid the XOR on each byte. // The Axis definitions: x-axis is always pointing forward, the y-axis points to the right, and the z-axis points down. // and calculating roll and pitch Angle relative to earth plane in degrees. // thanks to duckhead and knuckles904. // Please note also the loss of the bit0 resolution. // Byte 5 Bit 0 and 1 is used for nunchuk (0 0) or motion plus  (1 0) detection. //the same ratio (it seems that the sensitivity is 20 mV/deg/s and 0.5 mV/deg/s), which is to say it's proportional to 4:1. //The system clock function millis() returns a value in milliseconds. We need it in seconds. //Instead of dividing by 1000 we multiply by 0.001 for performance reasons. //WM+ variables  R represents the measurement covariance noise. //In this case, it is a 1x1 matrix that says that we expect 0.3 rad jitter from the accelerometer. // Q is a 2x2 matrix that represents the process covariance noise. In this case, it indicates how much we trust the acceleromter relative to the gyros. // You should play with different values here as the effects are interesting. Over prioritizing the accelerometers results in fairly inaccurate results. double dt = ((double)(now - lastread)) * SecondsPerMillis; //compute the time delta since last iteration, in seconds. *           Wii MotionPlus, scaled to fast/slow. *       with the matrix algebra that it came from. So I went with the matrix algebra and tweaked his implementation here. * will smooth the values a tad. Gyro drift is still a problem, however. // Remove callibration values from nunchuk accelerometer to zero the values. // The execution of this function results in the updating of 3 globals, accelAngleX, accelAngleY, and accelAngleZ with the angle in radians. // The real purpose of this method is to convert the accelometer values into usable angle values. // applicable. Yaw(Z) is not since there is no 'tilt' with respect to the earth. * into the range specified by hi-lo. Most of the time lo should be 0, and hi should be 1023. * Initialize the kalman structures. * This function processes the byte array from the wii nunchuck. Here you can download this file.